Altitude range: Around 100-300 metres above sea level. Habitat and Ecology: This species grows in semi-desert shrubland on the edge of the Chihuahuan Desert. The species is often found on limestone outcrops or in alluvial soils at the foot of hills and ridges and usually grows under other bushes. Plants may be solitary or may have many stems forming low mats. The population of C. nickelsiae is still large and stable and is abundant in places where there has not been any disturbance. However some habitat were C. nickelsiae grows has been lost in some areas, e.g., around Monterrey, due to urban expansion (settlaments and roads). 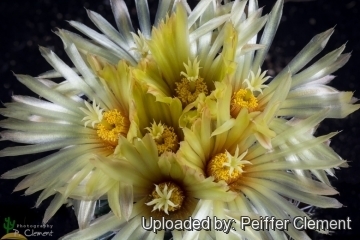 Description: Coryphantha nickelsiae (Mamillaria nickelsae) is a solitary to densely cespitose cactus species, forming low mats with the stems nearly hidden by overlapping numerous, fine spines. Older specimens often have characteristic ribbonlike uppermost radial spines. Some authors consider this taxon to be a variety of Coryphantha sulcata (see Hunt et al. 2006). Derivation of specific name: The epithet "nickelsiae" honors the Texas cactus collector Anna B. Nickels. Stems: Deep-seated, aerial portion hemispheric or hemispherical or globose more or less flat-topped, tuberculate, pale to dark green and glaucous, 4 to 11 cm high tall, (4-)5-7 cm in diameter; older plants becoming purplish. Solitary (especially in western part of the range) or often branched from the axils of the lower tubercles near the surface of the ground and forming mats (mainly in the eastern part of the range). Roots: Roots diffuse or short taproots; branches root adventitiously. Tubercles: Bluntly conical, firm, rather broad at base, low, not densely arranged,soft, to 7-10(-13) mm long, becoming quite as broad and imbricated, almost hidden by the overlapping spines, sometimes with glands among the spines. Areolar glands seasonally conspicuous. Central spine: Usually one (only in older specimens), sometimes absent, erect, straight or slightly curved downward, 11-16(-20) mm long, from all the upper areoles. Radial spines: (13-)14-16(-20), crowded, slender, white, 8-23 mm long, at first simply spreading but afterwards bent back and interlaced with those of adjoining tubercles. The lowermost radial spines 8-10 mm long, the upper ones, at least on old plants, often longer, stouter, extending into the groove and forming a fascicle, the clustered fascicles making an upright tuft at the vertex, slender. All spines at first yellowish at base with dark reddish-brown tips, but afterwards bleaching white, others brownish to nearly black throughout. Flowers pale: Flowers apical or nearly so, light yellow, 4.5-5(-7) cm in full expansion. Inner perianth-segments ca. 30 per flower, spreading, linear-lanceolate, acuminate, ca. 30 mm long. Outer perianth-segments entire. Filaments white or pale yellow. Anthers yellow to orange-yellow. Stigma lobes 5-8, white or cream, 2.5-8 mm long. This species flowers in summer (August to September). Fruits: Nearly globular, or ellipsoid, grey-green or bright green (paler at base), (5-)18-23 mm long, 8-10 mm wide. Floral remnant strongly persistent. Seeds: Small, orange, drying to brown, spheric to comma-shaped, 1.1-1.7 mm, finely and weakly raised-reticulate. 1) Heil, K., Terry, M., Corral-Díaz, R., Guadalupe Martínez, J., Goettsch, B.K., Lüthy, A.D. & Dicht, R.F. 2013. Coryphantha nickelsiae. The IUCN Red List of Threatened Species 2013: e.T152538A648394. http://dx.doi.org/10.2305/IUCN.UK.2013-1.RLTS.T152538A648394.en. Downloaded on 11 May 2017. 2) Benson, L. “The Cacti of the United States and Canada.” Stanford University Press, Stanford, California.1982. 3) Dicht, R.F. and Lüthy, A.D. “Coryphantha Cacti of Mexico and Southern USA”. Springer-Verlag, Berlin. 2003. 4) Hunt, D., Taylor, N. and Charles, G. (compilers and editors). ”The New Cactus Lexicon”. dh Books, Milborne Port, UK. 2006. 6) Vargas, V.A. and Martínez-Ávalos, J.G. “Notas sobre nuevas localidades de Coryphantha nikelsiae (K. Brandegee) Britton & Rose.” Cactáceas y Suculentas Mexicanas 56(2): 1-4. 2011. 10) Urs Eggli, Leonard E. Newton “Etymological Dictionary of Succulent Plant Names”. Springer, Berlin/Heidelberg 2010, ISBN 978-3-642-05597-3, S. 166. 11) Katharine Brandegee “Notes on Cacteae III.” In: Zoe. 5(2): 31, 1900 retrieved from http://www.biodiversitylibrary.org/page/568104#page/15/mode/1up 11 March 2017. 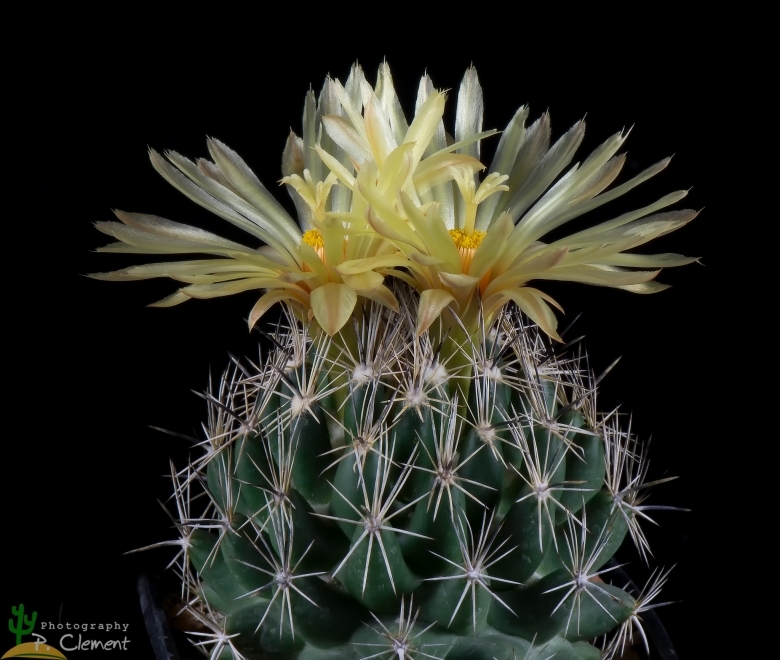 Cultivation and Propagation: In culture Coryphantha nickelsiae is without problems and regularly shows its large yellow flowers. It is a summer-growing species of easy cultivation but sensitive to overwatering (rot prone).